Sanjay Dutt might not be the most prolific of singers, but composers almost always manage to create entertaining songs with his vocals. 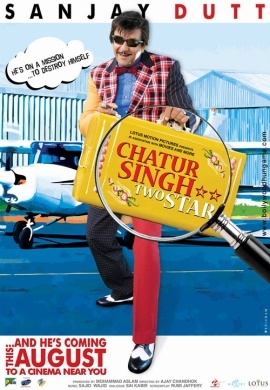 Singh Singh is another one to add to the list, Sajid Wajid producing a smartly arranged cloak-and-dagger-ish tune with the actor. The dash of Arabic in the second interlude is a nice touch. The Arabic elements are accentuated in the remix. Dutt is joined by Wajid, Khurram Iqbal and Asif Ali Baig in the song. Chandni Chowk Se sung by the composers and Hard Kaur is a middling track though. So is Ishqan Da despite an energetic effort by Sonu Nigam and Shweta Pandit. The composers bounce back again with the item number Jungle Ki Heerni which bears a very Munni-ish feel about it (same or a close raga I think) except that Sunidhi Chauhan delivers this one. The remix is just so so. Murga Anda Dega that ends the soundtrack should make for a better onscreen experience (assuming it’s been shot in a genuinely funny way) than an audio one, with its Devang Patel-esque tongue-in-cheek lyrics and everything. Sanjay Dutt sings this one too with Suzanne D’Mello, but not with as much satisfactory results as with the opening track. Sajid Wajid produce another passable score in Chatur Singh Two Star, like they have a major part of their repertoire. But after that song they did for No Problem, anything goes.